This week with the Summer Crew was a very interesting experience. The weather was nice and cool for the majority of the week helping the Summer Crew water a record number of trees - 200 - in a single day. In addition to hard work, this amazing accomplishment was aided by new automatic pumps that were delivered during the middle of the week. All of us helped lift the large and heavy watering mechanisms onto the trucks. Although the pumps are slow, it helps to have people and a hose watering different trees at the same time. The best part of the week was our planning and design day at Casey Trees' headquarters. It was even more heavenly due to the air conditioning inside the office compared to the scorching 90 degree weather outside. We spent all of our time with Maisie Hughes, Director of Planning and Design at Casey Trees. This day was very fun and interesting. I learned a lot. We played games such as Tree Jeopardy and learned the role an arborist plays in nurturing trees in the city. 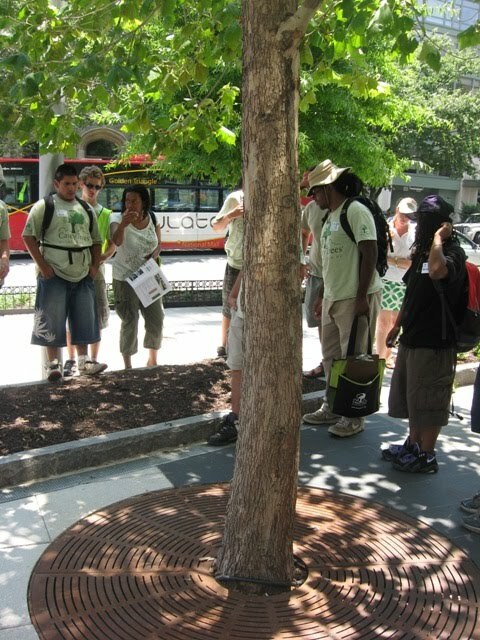 We learned new techniques to plant and care for trees in the city. After our indoor activities, we took a short walk to a park where we observed all of the ways trees affect a community. We then traveled back to the office and did an activity involving maps. 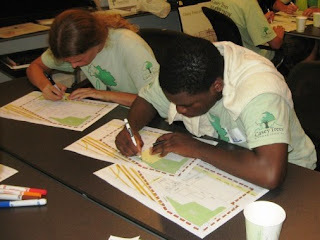 In this activity we were all given a map, a pencil and instructions to develop a tree friendly low-impact concept design for a site in the Navy Yard neighborhood. The exercise tested what we learned throughout the day. My best idea was putting trees on the roof of a parking garage. Overall I enjoyed this week due to the great weather and the change from the normal routine. Hopefully we can break another single day record for tree watering and learn just as much as we did this week.